The Firemen’s Relief Association built the Fire Museum in 2008. 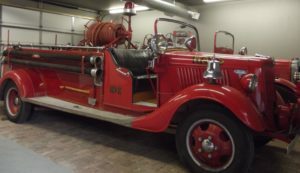 It houses two retired fire trucks, fire fighting equipment, and information about the Fire Department in Hays. Children can try on fireman’s gear and have their photos taken in front of the trucks!